The Enhancement feature allows players to modify Equipment and can be accessed from the player's interface. Players can upgrade the Equipment's star level via star stones, players can even transfer the star level from one piece of Equipment into another. 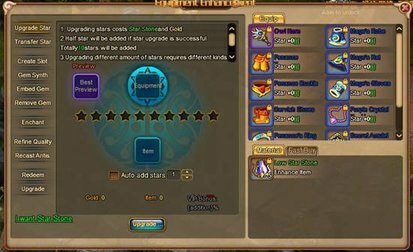 After a piece of Equipment gains 10 stars it will be maxed out. Players can also create slotted Equipment using a slot Talisman as well as synthesize gems by combining multiple low level gems to create a single higher level one. The gems can then be inserted inside the slotted Equipment in order to grant additional stats. Gems can also be removed if players wish to do so. The quality of the equipment can also be refined, resulting in either average, fine, outstanding or excellent quality. If players wish to they also have the option to refresh the attributes on a piece of Equipment in order to change the stats into ones that are more suitable for them. Finally players can upgrade orange equipment by sacrificing lower level equipment by using it as a catalyst.